Whether an artist has one album or 20, I think of myself as the type of fan who likes to go to a concert and be surprised. As I’ve gotten older this seems to have become especially relevant to me. With Facebook, Instagram and YouTube especially, it isn’t hard now to not only find, but practically see the whole show anyway. Sometimes temptation will be too strong to resist—like Madonna’s MDNA Tour in 2012. The built-up anticipation after months and months proved too strong, and I allowed myself to see some sets and costumes; fortunately this actually helped me enjoy the whole spectacle. 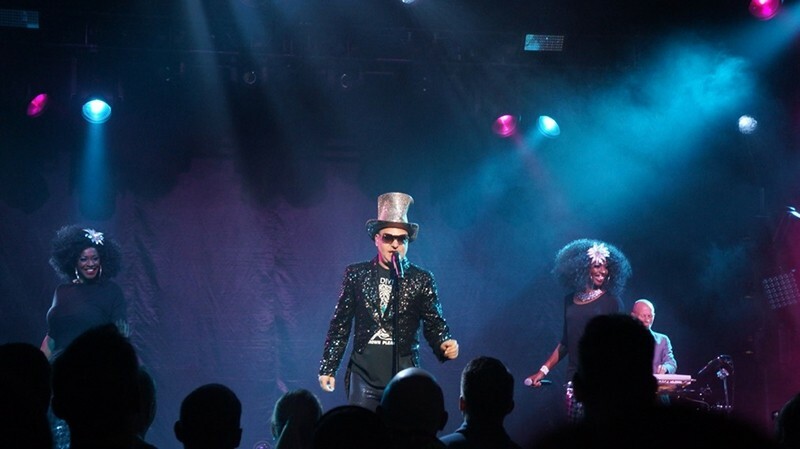 Now, I’ve seen Erasure in concert many times, both here in Salt Lake City and in San Francisco. Before the Internet—for their spectacular Wild! Tour—they actually came twice: playing at the Salt Palace for the first leg on March 4th 1990, then returning on July 1st of that year with a completely revamped set for the second up at Park West. In the early days of the web, a long-lost friend and I would seek certain information, like for shows we were heading to see in California, specifically 1997’s nearly back-to-back Tiny then Cowboy tours. But mostly to learn that they were playing their then-new single, “In My Arms,” and future single “Rain” on the Tiny tour, as Cowboy was released in the UK on the actual day of the Los Angeles show, and therefore hadn’t reached our hands/ears quite yet. Or to catch that then-rare fan photo of a costume—remember, this was pre-smartphones—just to whet our appetites. It was nothing like what can be found online nowadays. When synth godfathers Vince Clarke and Andy Bell announced that their Violet Flame Tour would be making a stop in Salt Lake, I wanted to know very little about it. It has truthfully been a little hard to resist—especially when I got the unique opportunity to interview Bell a few weeks ago. I had tour info written down for a few questions, but actually preluded the first one with a personal disclaimer that I was avoiding spoilers. As it turned out, we didn’t get the opportunity. Aside from seeing a photo or two of the tour’s debut on September 12th in Miami, I have been successful in my self-imposed exile, but as the 29th approached, especially after listening to the album so much and talking to so many people about it, I literally couldn’t wait to experience the show. After an absolutely surreal and quasi-religious meet and greet experience where they very graciously autographed everything I brought, I spent the next while chatting and reminiscing pleasantly with some very nice fellow fans. I am lucky that in my former life I used to manage a local indie record store, so it was an honor to see so many familiar faces and to reconnect with the people attached to them and talk about music and of course, Erasure. We’ve all gotten older, but our teenage-like obsession over collecting hasn’t. It was all happy memories discussing the former store’s midnight release parties for Cowboy and I Say I Say I Say, our travels to see bands and how tellingly the music of our youth helped shape us and our musical tastes. One of the perks of the meet and greet was early access to tour merchandise. One of many temptations was a chance to buy a limited autographed setlist from that show. However, those weren’t quite available yet—they hadn’t been signed, as the merchandise gentleman explained. If one had been sitting out on display that would have been my first real spoiler, but I was distracted by the arrival of Messieurs Clarke and Bell through the Capitol Theatre’s lobby! Some time later a good friend stood patiently in line and purchased one and I just had to see it. With all the excitement of the show starting, the emotion from meeting the band, and the nostalgic reminiscing, it was hard to take in. Besides the obligatory hits (like The Innocents’ much-loved “A Little Respect” and “Chains Of Love”) the only thing I really noticed was the absence of selections from the new album. I only recall noticing new single “Reason” and their current Billboard Dance Chart smash “Elevation,” and this both shocked and excited me. But I didn’t have much time to contemplate what this meant as I was searching for other friends and the show was about to start. Oh, the joy of a great live performance—especially by one of your favorite groups. There truly is nothing like it. The excitement inside the theater itself was literally electric. The sold-out crowd, a sea of happy faces, was about to be permanently elevated out of their seats for the next 90 minutes. As the house lights dim and the stage lights start dancing, a dapper Clarke enters to screams and applause and the music begins subtly and then Bell can be heard harmonizing the word “love” with the band’s longtime backing singers, the Chalmers sisters (Emma and Val). Suddenly, Clarke’s synths confirm that this opener is “Oh L’Amour” and soon the ladies, clad in silver and black, enter and start dancing and finally, teasingly, a resplendent Bell (in silvery top hat and jacket, shimmery tight pants and rock-star shades, no less) walks out while the screams grow louder, and this classic’s instantly infectious melody really begins. It’s a great and unexpected opener that creates an energy lasting for the entire show. Another surprise follows: Wild!’s fourth single, “Star,” and it sounds magically re-worked, as though recently remixed. It is well-received. Next up is Violet’s new single, “Reason,” with its glorious sing-along chorus—and everyone does. In fact, there didn’t appear to be a single song that most of the crowd didn’t know the words to.